Coffee and coffee culture is so important in both Ethiopia and Sweden, where you were born and where you were raised, respectively. Can you share what significance it has for you personally? Coffee culture in Ethiopia and Sweden couldn’t be farther apart in the actual rituals but for me I always associate it with family memories and the bringing together of friends and loved ones. Obviously as coffee is grown in Ethiopia it so much part of everyone’s life and diet. How you drink your coffee can vary depending on which tribe you’re from some have it with butter, or with salt or with barley they all celebrate it differently. What memories do you have drinking coffee in Sweden? I always remember my Grandmother getting out her finest coffee cups for afternoon coffee and serving coffee with 7 different types of cookies which is a big Scandinavian tradition. My Grandfather was old school and loved drinking it from a saucer which used to annoy my grandmother so much but brings back very happy, vivid memories for me! I'm excited to attend the sold out Ethiopian coffee ceremony at SF Chefs this Sunday. When did you first experience it? What was it like? How did the relationship between you and illy begin? I am a coffee lover and a longstanding fan of illy. Ethiopia is the birthplace of coffee and mine too. The creation of illy’s first ever single origin coffee presented the deal opportunity to partner with illy. The unparalleled commitment to sustainability and quality shown by illy is something I look forward to becoming a part of over the upcoming year. What are you looking forward to the most about coming to San Francisco? Will you have any time to hang out with favorite chefs or at restaurants? I'm sorry to be missing your illy Explorigins MonoArabica cooking demo with Chris Cosentino on Saturday at SF Chefs. Can you tell us what you will be cooking as the main course? I will be cooking a coffee-cured duck salad with peach vinaigrette using illy’s Ethiopian MonoArabica Single Origin*. Any tips for cooking with coffee? Using it as an ingredient? *Ethiopian MonoArabica Single Origin is part of illy's introduction of the first single origin coffees, representing the best of their original famous illy blend. MonoArabica features the highest-quality examples of 100% sustainably grown Arabica coffee from three countries – Brazil (intense and full bodied), Guatemala (complex and medium bodied) and Ethiopia (delicate and aromatic) You can sample MonoArabica at espressamente illy, 123 Battery Street. San Francisco. 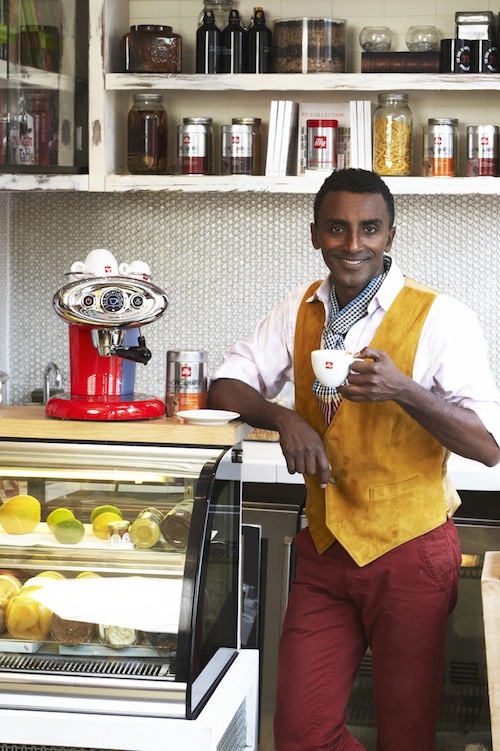 - Marcus Samuelsson will be signing copies of his new book, Yes, Chef and offering tastes of MonoArabica with illy's Master Barista Giorgio Milos from 3-4 pm in the illy Lounge. Please note: This is not a sponsored post! I am being compensated in my role as social media correspondent, but I am NOT compensated to post about illy or any other brand. If I do so, it is only because I sincerely find it interesting and of value. I hope you do too.